A group of volunteers, with the help of professional psychiatrists and psychologists, lend their ears and shoulders to cry on with no judgement at all. The Befrienders lend their services by befriending a person in need. Feel free to contact them via their hotlines and emails, as provided below, should you feel lonely, suicidal or just need someone to talk to, for any reason. Open 24 hours, Childline Malaysia is an emergency outreach service for children going through a crisis period, which is when a child is in danger in any way, such as physical, sexual or emotional abuse from other individuals, their families, schools or institutions. It aims to protect children, below the age of 18, regardless of their race, religion, nationality or their social status, as well as provide them with emergency assistance as well as long term rehabilitation through their partnered organisations. Contact them through their Facebook or email as shown below. Talian Kasih provides emergency services for abuse, neglect, household violence as well as problems regarding children and juveniles. They provide help for single mothers, the poor and people with disabilities. 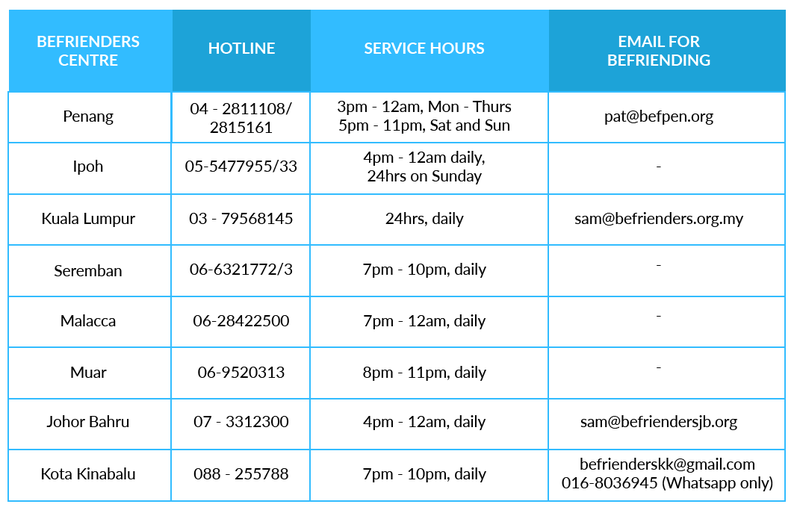 Counselling services are also available through their hotline. Talian Kasih works as a single point of contact to help assist you in anyway, should the need arise. Contact them through their hotline below.